The covers of the new Diamond Jubilee booklet match the colour of the stamps inside, so it's goodbye to gold and hello to the wishy-washy-grey-blue. Calling it 'diamond blue' doesn't really make it any better. Word is that at the end of the jubilee year we will see 'flame' or orange again instead of gold. The cylinder numbers are W1 blue, W2 phosphor, W1 transparent/silver overlay. News as we get it relies on what I find and what other people find, so please send your news! Visit Norvic Philatelics for background on stamp issues and postmarks from 2003-2018, and our web-shop for stamps, postal history, FDCs and postcards. Friday 13th - lucky for some! 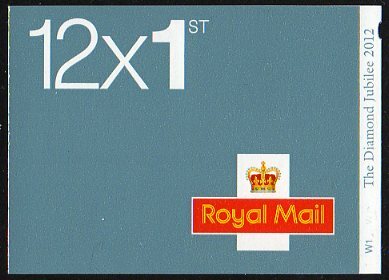 British Postmarks Database - add yours! Stampboards - free forum, no ads, read the rules!